Tomescu’s drawings are characteristically gestural and layered, and occasionally include collage. She first began making pastel drawings on prints in 1986 while producing etchings with printer John Loane, as a way of maintaining her continuity of thought during the printmaking process. Later, however, they became an independent part of her practice for a time and she had etchings specially printed for drawing on, as she was attracted to their surface quality and the contrast this made with her drawing materials. Tomescu’s drawings are an open-ended form of inquiry into the process of drawing itself, in which the interaction of marks and surface are poetic and allusive, rather than representing a narrative. 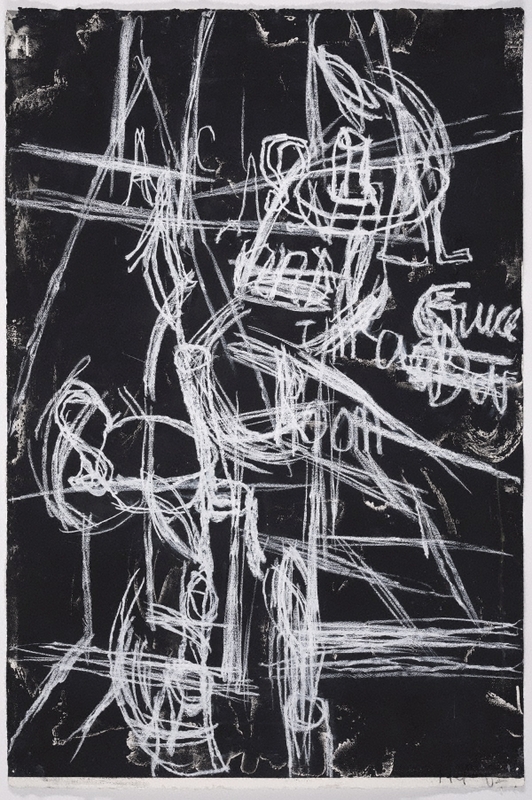 Stemming partly from earlier works such as her ‘Negra’ series of lithographs, 'Negru IV' and 'Negru III' are from a group of works made concurrently in 2002 on the theme of blackness – ‘Negru’ is the Romanian word for ‘black’. Of these, four became the 'Negru' suite that includes this diptych (of the others, 'Negru II' was gifted to the Gallery in 2003, while 'Negru I' remains in a private collection). The series was triggered by the memory of a powerful small painting by New Zealand artist Colin McCahon (1919–87), 'A candle in a dark room' 1947 – a work that was itself inspired by McCahon’s meeting with a poet. While the drawings complement each other and were dependent on each other in the drawing process, each ultimately can be seen as individual works of art. Signed and dated l.r. corner, black pastel "ACT '02". Signed and dated u.l. corner, verso, pencil "Aida Tomescu/ ... 2002"